Justice Jallow was speaking at a press conference in Kotu in relation to the commission’s just ended country-wide consultation process. 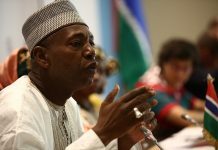 He however said, the sum of the most pertinent issues raised by the Gambian community at large relates to concerns about the governance of the country. He reiterated that the CRC public consultations process afforded many with a rare opportunity to vent their frustrations at how government is administered, adding they do not trust the educated class. They seem to view as untrustworthy, greedy, unreliable and without conscience; “one even indicated that he does not trust his educated sons because of how he has seen them amass their wealth”. He added some amongst them have even called for farmers to lead this country, saying what was striking in all of these engagements was the absence of political partisanship. “People spoke with knowledge and respect and expressed the hope that the educated class will use their positions to truly develop this country and rural Gambia”. Justice Jallow revealed that the consultative process would also incorporate the views and aspirations of Gambians living in the diaspora and it will cover some countries in Africa, Europe and some states in the United States of America. He noted that they have prepared the following preliminary draft which is currently under review through dialogue with the Hon. Attorney General. Senegal and Mauritania have been listed; Angola is under review; In Europe, the listed cities are London (UK), Barcelona (Spain), Paris (France), Stockholm (Sweden), Berlin (Germany) and Brussels (Belgium); In the USA, the listed cities are New York (NY), Atlanta (GA), Washington DC (DC), Seattle (WA) and Minneapolis (MN)”. He stated the CRC hopes to be in a position to finalize the list of venues for the public consultations with Gambians in the diaspora and to publish the final list as soon they are able to confirm the availability of funding. 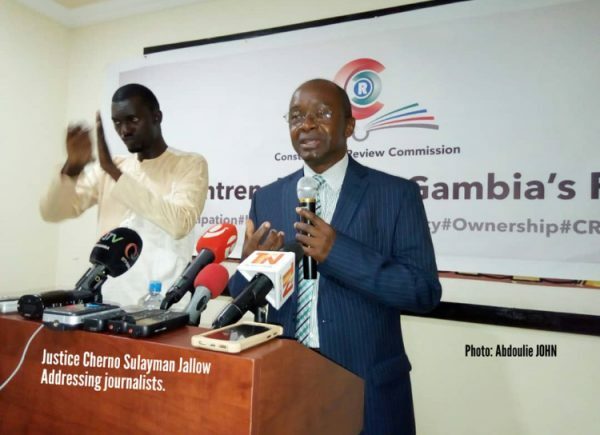 In his closing remark Jallow reminded the media that the CRC is mandated to draft a new Constitution for the Republic of The Gambia and to prepare a report in relation to the draft Constitution. Justice Jallow added that the CRC is independent and does not represent any particular interest group institution.